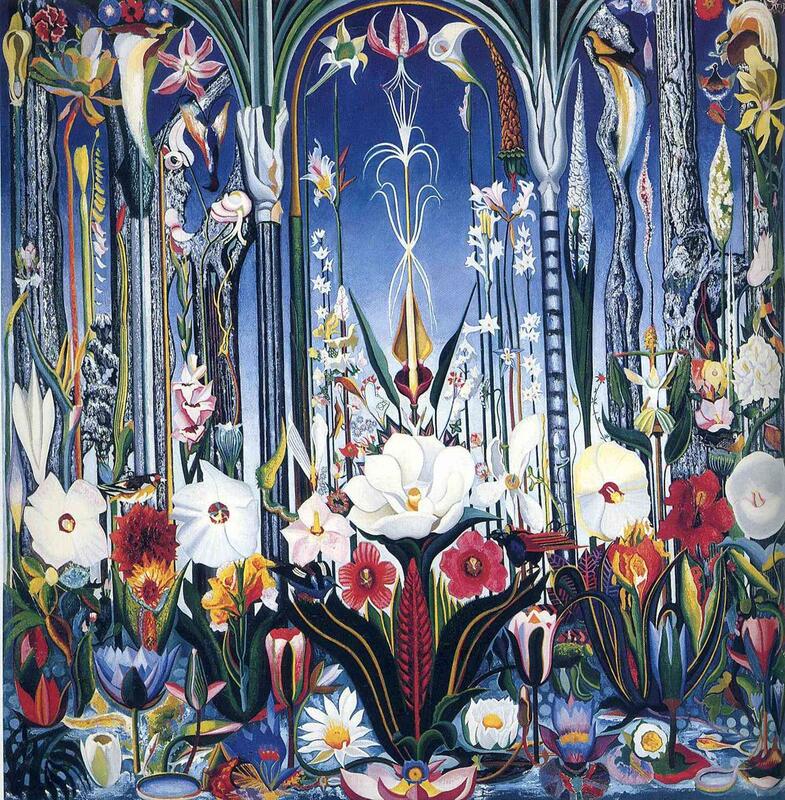 Joseph Stella (1877–1946), Flowers, Italy (1931), oil on canvas, 190.5 x 190.5 cm, Phoenix Art Museum, Phoenix, AZ. Wikimedia Commons. By the mid 1920s, Joseph Stella (1877–1946) appeared to be pursuing three or more separate artistic careers, as a Precisionist who loved industry and smoke, as a modernist applying his great draftsmanship skills, and as a successor to Bosch in near-Surrealist fantasies. Joseph Stella (1877–1946), The Apotheosis of the Rose (1926), oil on copper, 213.4 x 119.4 cm, Private collection. Wikimedia Commons. The Apotheosis of the Rose from 1926, painted in oil on copper, is a brilliant example of the last of those styles, with its extensive collection of exotic birds and weird vegetation. Joseph Stella (1877–1946), Purissima (1927), oil on canvas, dimensions not known, High Museum of Art, Atlanta, GA. Wikimedia Commons. 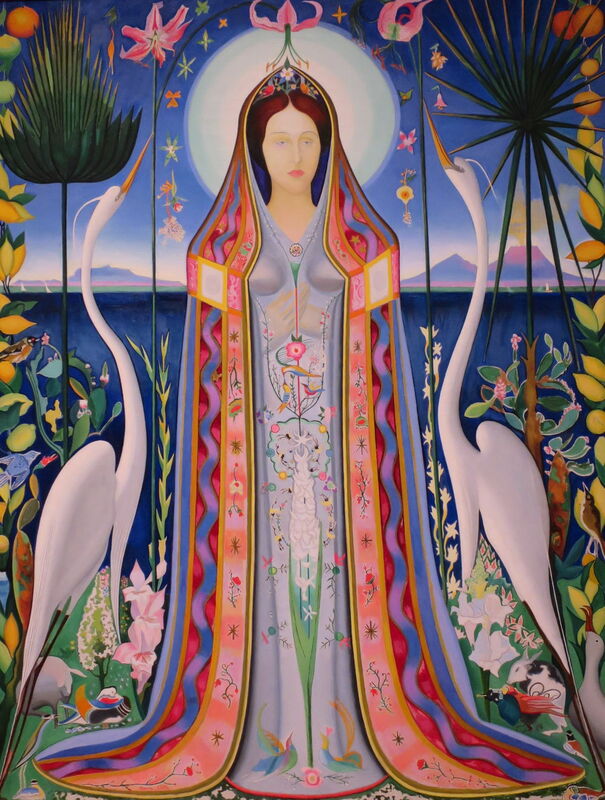 Stella’s Purissima from 1927 places a mystical woman between the two sacred Ibis birds. In the background is the Bay of Naples, with Mount Vesuvius at the right. 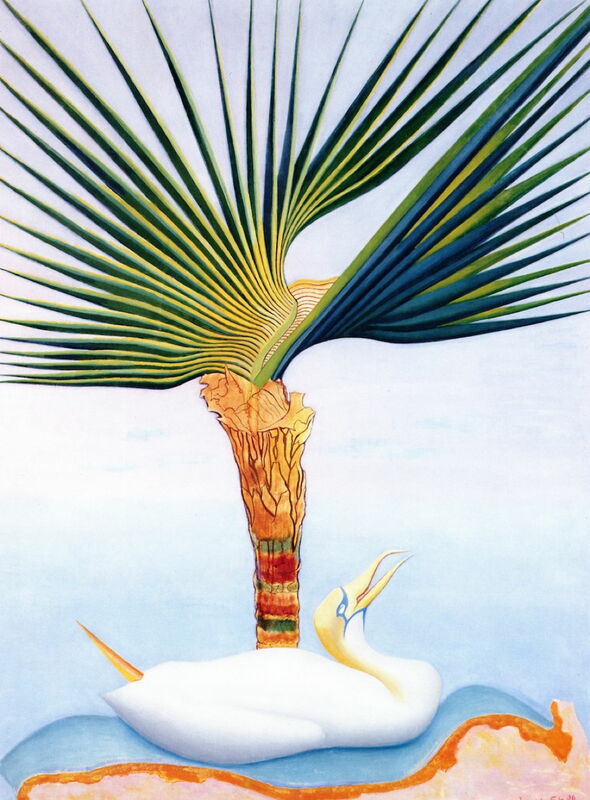 Joseph Stella (1877–1946), Palm Tree and Bird (1927-28), oil on canvas, 137.2 x 102.2 cm, Private collection. Wikimedia Commons. Later in the 1920s, Stella developed rhythmic palm structures, in Palm Tree and Bird from 1927-28. These were to be a recurrent feature in many of his later works. Joseph Stella (1877–1946), Neapolitan Song (1929), oil on board, 97.8 x 71.8 cm, Private collection. The Athenaeum. 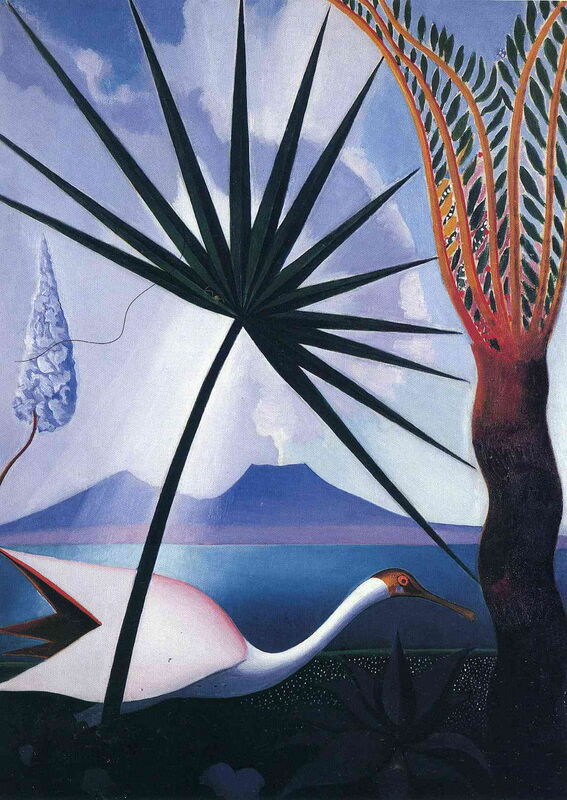 Neapolitan Song (1929) brings a waterbird and palm in front of the quietly smoking volcano of Vesuvius. 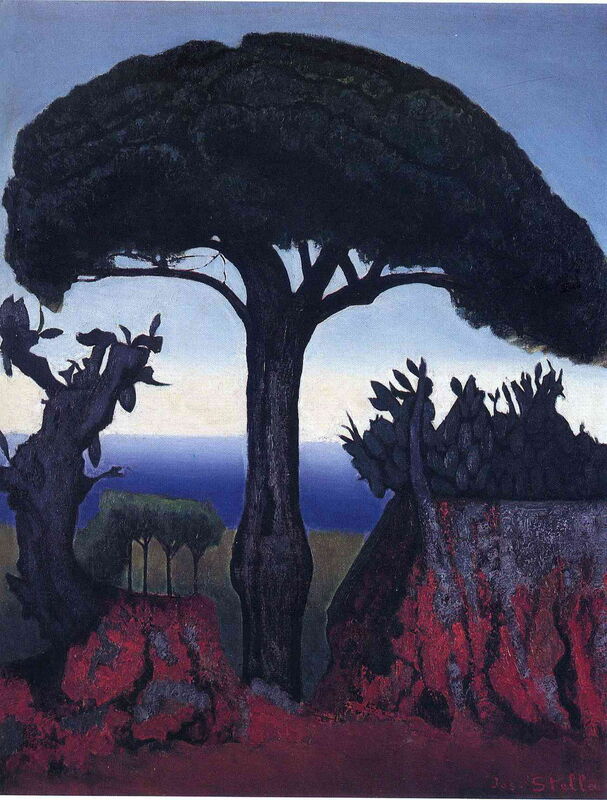 Joseph Stella (1877–1946), Vesuvius III (date not known), oil on canvas, 25.4 x 30.5 cm, oil on canvas, Private collection. Wikimedia Commons. This undated landscape sketch of Vesuvius III probably dates from this period. This appears to have been made looking south-east across the Bay of Naples, with Castel dell’Ovo nearest. Joseph Stella (1877–1946), Tree of Nice (c 1930), oil on canvas, 81.3 x 66 cm, Private collection. Wikimedia Commons. He changes motifs again in Tree of Nice from about 1930, which was presumably painted in the south of France. The following year, his Flowers, Italy returns to near-Surrealism, with water-lilies at its base. 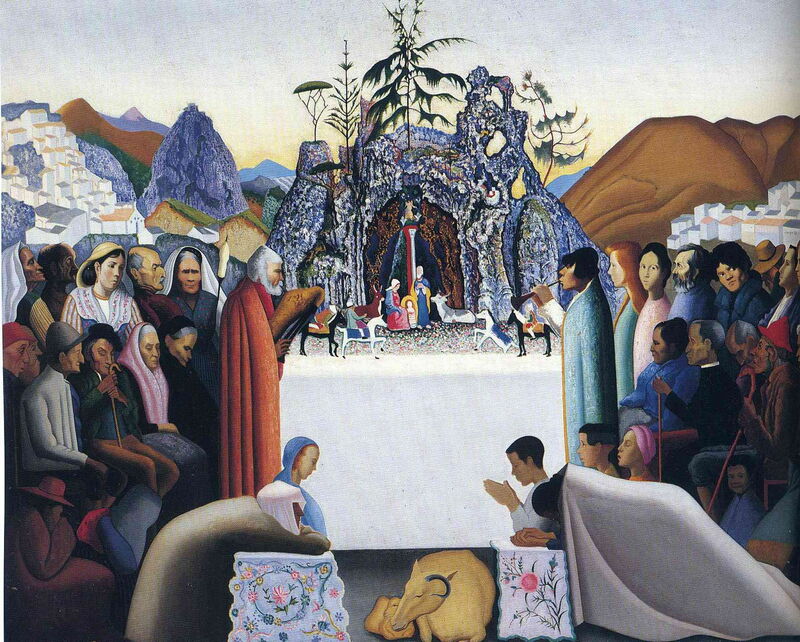 Joseph Stella (1877–1946), The Crèche (1929-33), oil on canvas, 154.9 x 195.6 cm, Newark Museum, Newark, NJ. Wikimedia Commons. The Crèche from 1929-33 is an ingenious framing of the Nativity. At its centre is the Nativity ‘crib’ so often shown at Christmas, with an audience who appear to have been drawn from Stella’s home city in Italy, playing traditional bagpipes in homage. In 1934, Stella and his wife finally settled in the Bronx. His popularity steadily faded, and a retrospective exhibition in 1939 failed to revive interest. His personal health also started to deteriorate at this time. Joseph Stella (1877–1946), Hibiscus, Shell, and Plate (c 1935), oil on canvas, 63.5 x 48.9 cm, Palmer Museum of Art, State College, PA. Wikimedia Commons. For much of his career, Stella painted occasional floral still lifes of great beauty. 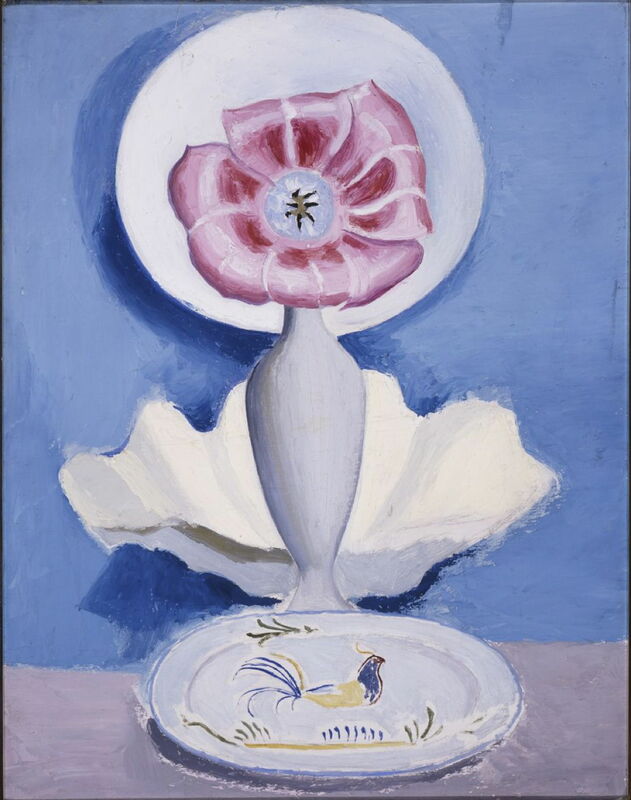 Hibiscus, Shell, and Plate from about 1935 is one of his later works in that series, with a single hibiscus flower in a white vase. 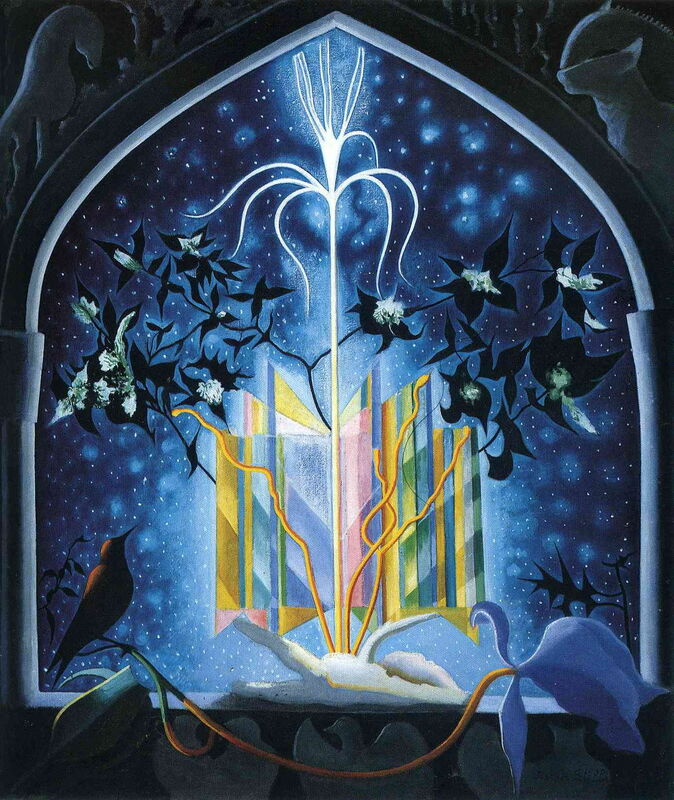 Joseph Stella (1877–1946), Serenade, a Christmas Fantasy (La Fontaine) (1937), oil on canvas, 109.5 x 119.7 cm, Hirshhorn Museum and Sculpture Garden, Washington, DC. Wikimedia Commons. 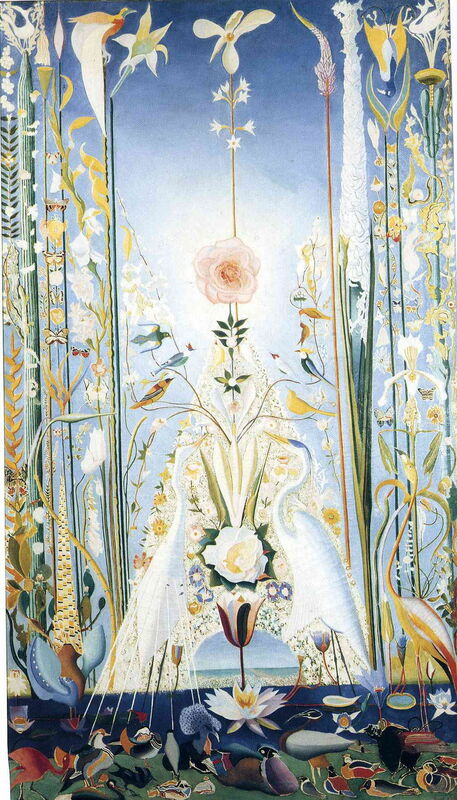 In 1937, Stella painted Serenade, a Christmas Fantasy, or La Fontaine, which is one of his last works combining birds and flowers in a fantasy setting. This appears to have been intended as a design for a Christmas card. In 1942, Stella became mostly confined to his bed because of worsening heart disease. 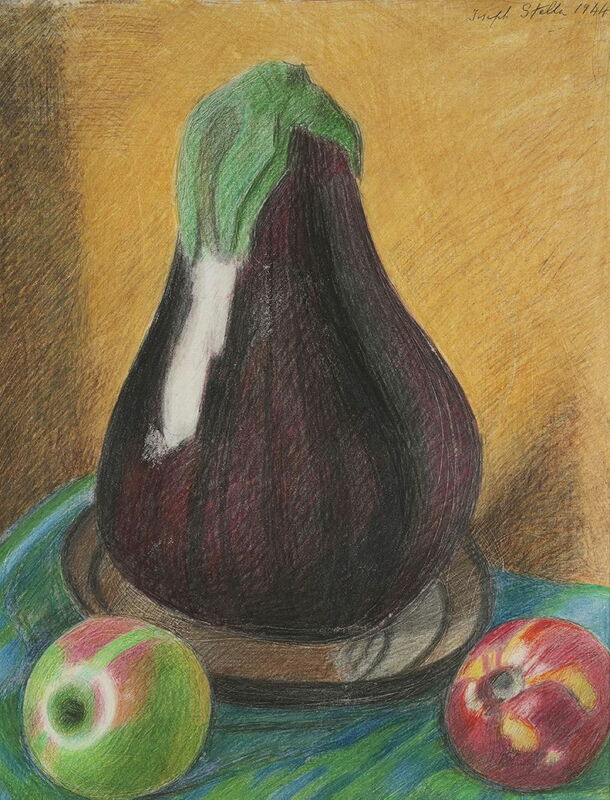 Joseph Stella (1877–1946), Eggplant (1944), crayon and silverpoint on paper, 53.3 x 42.9 cm, Private collection. Wikimedia Commons. Eggplant from 1944 is another work executed in crayon and silverpoint, and shows an aubergine and a couple of apples – popular fruit for a still life. 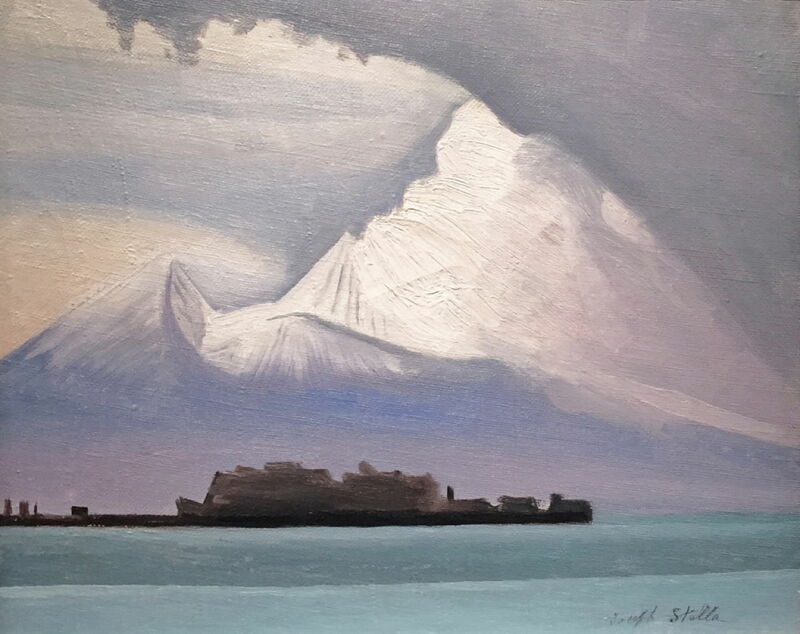 Joseph Stella died just after the end of the Second World War, in 1946. I haven’t come across any other artist who was, simultaneously, so many different painters, and so eclectic in his styles.